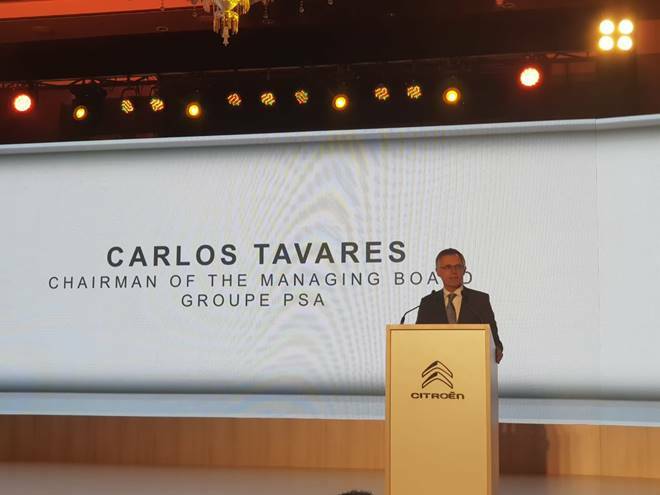 Citroen India Brand Launch Live Updates: PSA Group has its joint venture in India with CK Birla Group. Speaking of the brand's first SUV for India, the C5 Aircross has been spotted on test multiple times now. Here are the main highlights of the event. Citroen India Launch in Chennai Live Updates: French carmaker Citroen has made its official entry in India today at an event in Chennai. This is the second French car manufacturer to make its entry in India after Renault. Group PSA which is the parent company for Citroen will be manufacturing cars at the brand's production facility in Tamil Nadu outside Chennai. The said production facility is responsible for the supply of engines and transmissions currently that are meant for the domestic market and exports. At the event, the brand has also introduced and showcased its first product for India, the C5 Aircross SUV. PSA Group has joined hands with CK Birla Group. Speaking of the brand's first SUV for India, the C5 Aircross has been snapped while testing multiple times now. Coming to the PSA Group, the company's name is not something completely unheard of as it previously started with a joint venture with Premier Automobile Limited. Earlier, PSA's production facility was targeted primarily in the making of powertrains but an additional investment of Rs 600 crore will make the said facility apt for vehicle production. The factory will be manufacturing 50,000 vehicles in the first year and these will be meant for both, domestic market and exports. That's all folks from the India unveil event of the Citroen C5 Aircross SUV. Hope you enjoyed the proceedings as much as we did. Until next time! Goodbye, drive and ride safe. French carmaker Citroen has announced its entry into the Indian car market and the first product C5 Aircross SUV will be launched here in the year 2020. Starting 2021, the company will be launching one model range every year at least for the next three years and these will be Made in India models. 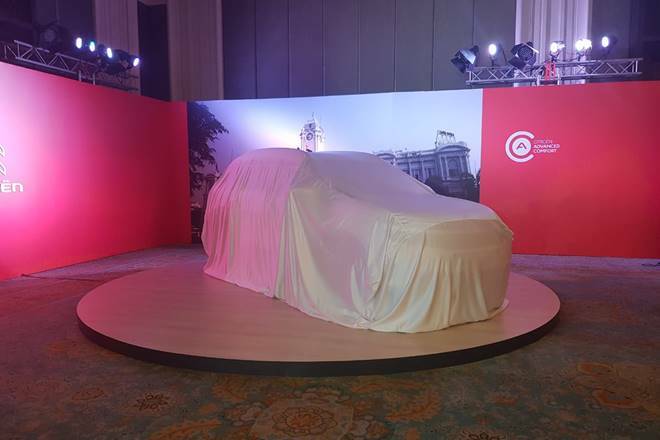 Apart from these announcements, the brand has also showcased the C5 Aircross SUV at the event in Chennai. Citroen has announced at the event that the gearbox made for Indian vehicles and localised will also be exported. This differentiates them from other European carmakers as they're localising the powertrain first with a target of 90 % localisation. Citroen has just showcased its first vehicle for India that will be the C5 Aircross. The SUV looks stunning in real especially with those sleek LEDs and a quirky yet appealing front fascia. The vehicle will be launched in India sometime by the end of the year 2021. 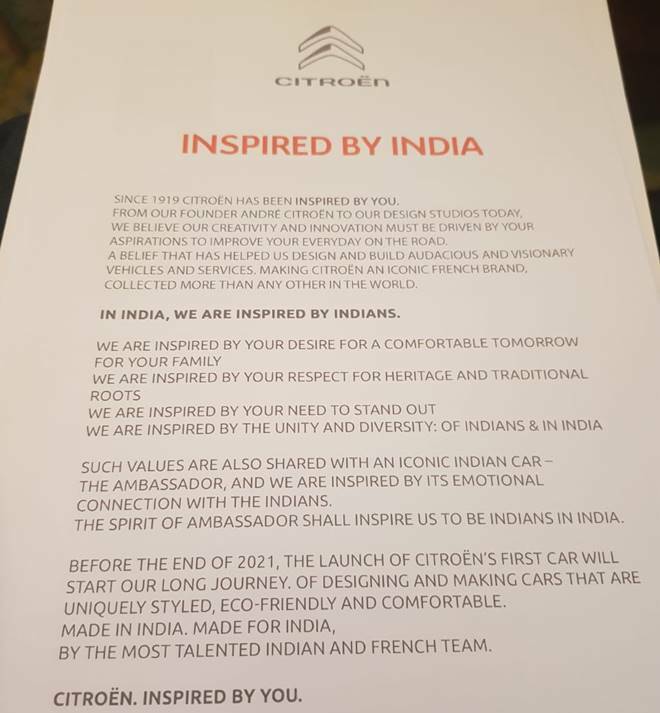 The second launch in India in 2022 by Citroen will be 'Made in India' for India unlike the C5 Aircross, which is a global model. The company looks quite aggressive in its product strategies and it looks like will be here to stay in its second innings in India. 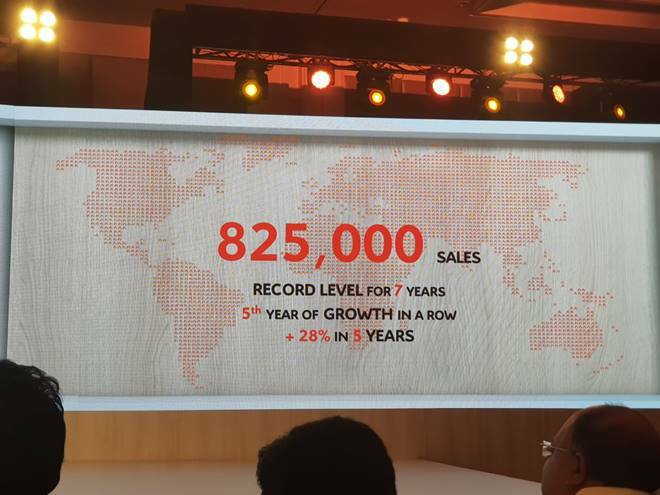 Citroen is currently talking about its sales performance outside India. The company has announced that it will be launching one new Made in India model every year from the year 2021. To launch three models in three years from there on. The C5 Aircross will be launched in 2020. Groupe PSA reveals its India strategy at the event. The company will make locally and localise components also for competitive costs. The brand has partnered with TCS for engineering. The Powertrain manufacturing to start in 2019 in Hosur plant in collaboration with Avtec. 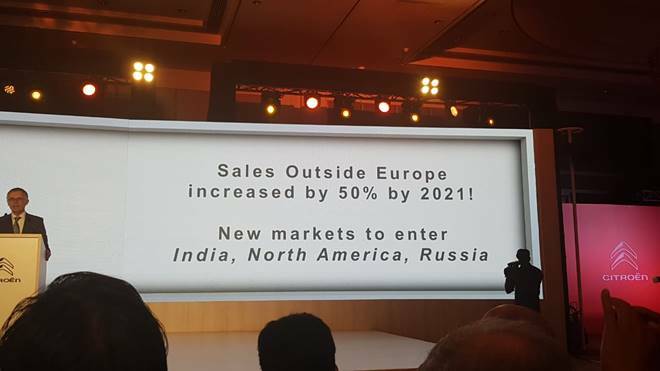 Here is the reason why the company is keen on entering new markets outside India. Groupe PSA is primarily aiming at three markets which are India, North America and Russia. Carlos Tavares, Chairman of Managing Board, Groupe PSA is now addressing the media at the event. He says that the company was on the brink of bankruptcy 5 years back but is today the most profitable carmaker in Europe. Some exciting announcements expected to be made soon, so stay tuned with us! The India launch event of Citroen has started in Chennai. Our colleague will be sending instant updates that we will be updating here. Stay tuned to know what all announcements the French automaker will be making for the Indian market. These will possibly include C5 Aircross and the return of the Ambassador. The event in Chennai is about to start in the next few minutes. Citroen has shared a note with the journalists that clearly mentions the Ambassador car. 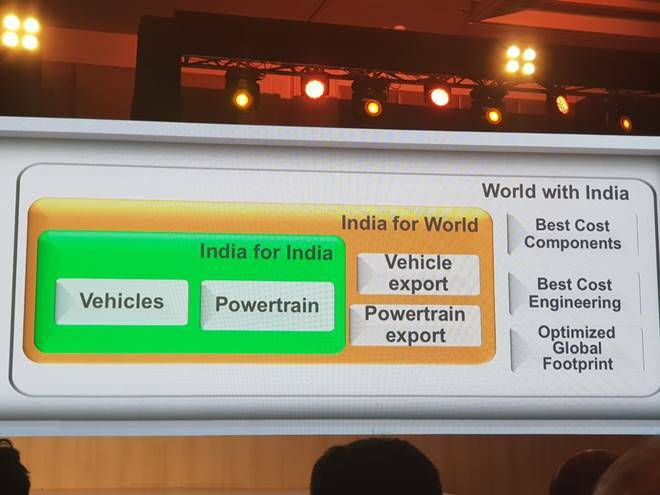 This suggests that the company's first car for India might be the Ambassador. However, nothing can be said with surety at the moment and although it is an indirect hint, there is no confirmation yet. There you have it guys! Our colleague has just sent us an image of the company's first vehicle that will be launched in India by 2020. The SUV is currently under wraps and it may or may not be the C5 Aircross. What do you think about the Jeep Compass and what are your thoughts? Let us know in the comments section below. Citroen’s present product portfolio includes the C1, C3, C3 Aircross, along with the C4 Cactus. Furthermore, the company also sells the Berlingo, C5 Aircross, E-mehari Grand C4 Spacetourer and C-Zero internationally. Out of these models, the C5 Aircross is expected to be the first car that will make its debut today. The vehicle is expected to be launched by 2020. The upcoming Citroen C5 Aircross will arrive to India via the Completely Knocked Down route (CKD). The vehicle will have 70 percent localisation. The five seater SUV will have a total length of 4500mm. More details to be revealed soon, so stay tuned with us. The company's production facility outside Chennai in Tamil Nadu is responsible for supplying powertrains and transmissions. At present, the factory has a total production capacity to roll out 2,00,000 engines and 3,00,000 transmissions annually. PSA Groupe's production facility will be responsible for the manufacturing of Citroen cars. The said facility will roll out 50,000 cars in the first year of its operations after an investment of Rs 600 crore has been made by the company to make it apt for vehicle manufacturing. André asked the engineers at his factory to make a car of good quality, that can be mass produced and is affordable. He also instructed them to limit the power output at 10 bhp. 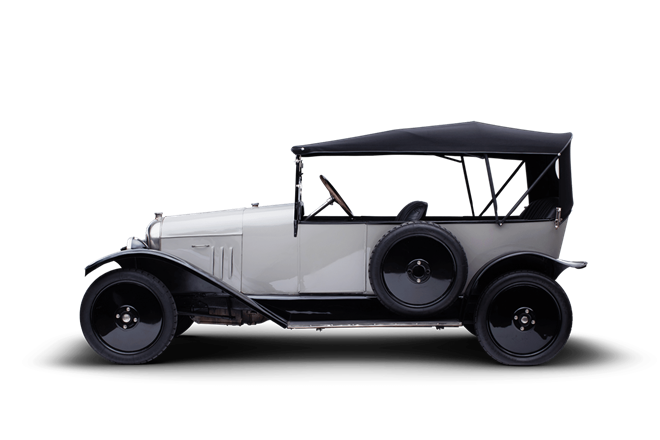 This led to the birth of the brand's first car - the Type A. The Citroen Type A rolled out of the company's production facility in May 1919. Here is how it used to look. Citroen is one of the oldest car manufacturers in the world and it intends to enter India as a premium carmaker. The brand was founded on 4th June, 1919 and the brand will be celebrating its 100th anniversary this year. The company was founded by a French industrialist Andre-Gustave Citroën. He decided to transform unused armament factory into a production facility for manufacturing cars. The upcoming Citroen C5 Aircross SUV comes based on Groupe PSA EMP2 platform on which the DS7 SUV is also based. The five seater SUV will challenge the likes of the Jeep Compass, MG Hector, Kia SP2i and more in the segment. More details on the Citroen brand to be revealed soon, so stay tuned with us. For its second innings in India, Groupe PSA has partnered with CK Birla Group with a production facility set in Tamil Nadu outside Chennai. The company will be launching its first car in India that will most likely be the C5 Aircross by the end of 2021. The joint venture between the two companies will include sales, service and procurement operation for the PSA group. Globally, the Citroen C5 Aircross SUV is offered in four engine options. Thes include 1.5-litre and 2.0-litre diesel engine options along with 1.2-litre and 1.6-litre petrol engine motors. A six-speed manual transmission will come as standard across the variant range while an eight-speed automatic unit will come as optional. Groupe PSA acquired the Ambassador brand name in the year 2017 by spending a considerable amount of Rs 80 crore. Currently, it is unknown as to whether the Amby is on its road to revival but speculations suggest that it will come in an all electric avatar. Citroen is a French automaker with the parent company being Groupe PSA. This is not the first time that PSA Groupe is making its entry to India. In the second innings, multiple premium cars and SUVs will be launched under the Citroen brand with the first one expected to be the C5 Aircross. Good morning folks! Welcome to the Citroen India launch LIVE blog. The French carmaker is set to enter into the Indian market and is likely to showcase its first product for India - the C5 Aircross SUV. Stay tuned for the updates. 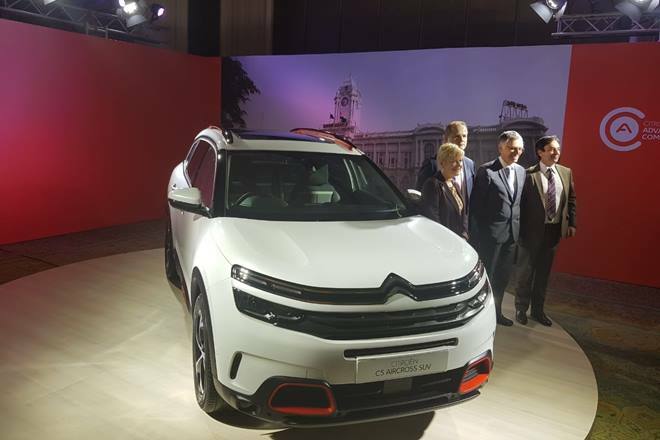 Groupe PSA owned Citroen has made its official entry to the Indian market today and has showcased the C5 Aircross SUV.